The Axure tutorials are a great resource, both for learners starting out with interactive prototyping and old hands in need of reference material during bouts of amnesia. But the approach suggested for constructing a tab control, whilst being a quick method, hinders subsequent maintenance and enhancement. Here, I propose a revised approach which is cleaner, lighter, and exploits Axure’s latent power. And I follow it up with a detailed tutorial. The Axure tutorial suggests placing each tab onto a different state of a dynamic panel. This means placing all tab buttons on every state, altering their appearance according to whichever tab is visible. Having to update many existing prototypes where this method had been used – editing the label on each instance of a tab button, or adding a new tab button many times, or moving sets of tabs – quickly grew tiresome. I needed an approach that meant that an update to a prototype would result in precisely one change, rather than one change for each tab. The solution is to keep the tab buttons separate from the tab panes. By adding buttons to a selection group and tweaking their Selected states this is possible. And that’s it, in a nutshell. But read on for a step-by-step guide. In Axure, add a rectangle. Optionally, set its shape to Rounded Top. Set its Fill Color to transparent. Edit its Selected Style, setting this Fill Color to white. Copy the button, paste it twice, and line them all up. Assign a selection group (select all three and use the context menu). This configures the buttons to be treated as mutually exclusive so that when one is in its selected state, the others won’t be. Name your buttons (Label in the Widget Properties pane), e.g. btn1, btn2, btn3. Label your buttons (double-click each rectangle), e.g. State 1, State 2, State 3. Add a dynamic panel, name it pnlTabPages and check its dimensions. Open the default state of the dynamic panel and add a rectangle at position (0, 0) with the dimensions noted previously. Select the rectangle and copy it. Add two more states to the dynamic panel, pasting the copied rectangle into each one. Name your dynamic panel’s states, e.g. pane1, pane2, pane3. Label your panes (double-click each rectangle), e.g. State 1, State 2, State 3. Position the dynamic panel so that it’s 1px above the bottom of the buttons and, with it still selected, choose Send to Back from the context menu. Doing this ensures that when a tab button is in its Selected state (with a white fill) it appears conjoined to the currently visible tab pane. 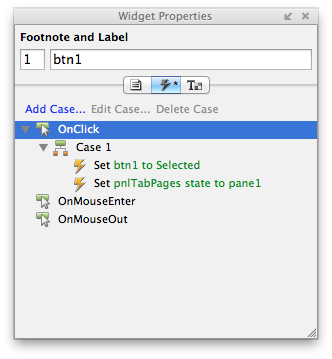 Finally, to ensure that a tab is initially selected, set btn1 to its Selected state in the OnPageLoad event (under Page Interactions). Want to change btn2’s label? Do it once, not thrice! Want to move btn3 to the left of btn1? Do it once, not thrice! Want to add a new tab? 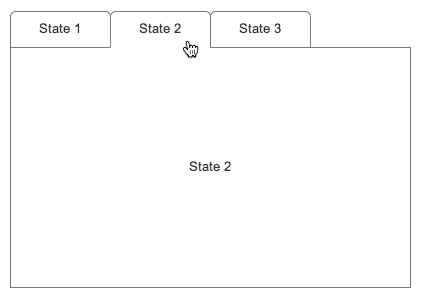 Add a state to the dynamic panel and one new button – not three! This entry was posted in Axure, Usability and tagged axure, better, prototype, sustainable, tab, tab control, ux by Stuart. Bookmark the permalink. I’ve been creating tabs this way since Axure added selection groups to its toolset and totally support this approach. It’s great that you took the time to explain the process because it really slims down your Axure file and makes you less dependent on complex dynamic panels. Great approach Stuart…My only question, in the panes…I’ve added links and onclick actions for those links. Seems easy enough, but when I run the prototype, the links are there, but seem not to work. Insight? Roman, thanks for the tip! Thomas, if you can make your RP file available I can have a look. I have placed hyper links int he panel states, but they seem to not work..At all. Everything else works smoothly. Thomas, the problem is your rounded rectangle that provides a border for the breadcrumb trail and tabs: it’s on top of those elements (think z-order, if that helps). Simply select the rounded rectangle, open the context menu (right click) and choose Order > Send to Back. I’ve been creating tabs this way since Axure 5.6, as well as teaching it on my Axure training courses (see http://www.ax-stream.com). It was made even better in 6.0 when selection groups were added.